This subpage of the errata pages is for listing the things which need to be corrected by reblazons on an LoAR, instead of a correction on an errata. Azure, a sun eclipsed, winged Or. Looking at the image in the files, it's hard to see a sun here at all. I'd blazon this as "Azure, a roundel sable winged Or." Kay of Locksley. Badge. Gules, a wooden pall raguly proper, cloee sable, and to dexter a dove migrant palewise argent. * Owen doesn't recognize the term 'cloee'. Context suggests it's artistic detailing. ?? Per Brooke-Little/Scott?-Giles, _Boutell's Heraldry_ p. 56, this is probably supposed to be "cloué", that is, "nailed". Istvan: This is stored under "Kay Gwenhwyfar of Locksley" in the '85 scans. Guled field. Wooden Y. There are nails in the wood, which is what makes it raguly. I do not think the nails are 'sable'. I think they're wood colored. JML: the nails are sable - there are three of them, the things on the side are branches, not nails (and yes, those are wood). Robear du Bois. Per bend sinister azure, a bear's head erased argent, andargent, in bend sinister three fir trees palewise vert. There's a typo here ("andargent"), and while it's being fixed, this should probably be made "Per bend sinister azure and argent, a bear's head erased argent and in bend sinister three fir trees palewise vert". Herveus: The typo was a transcription error and is fixed. The proposed reblazon needs to go through the normal process of reblazoning. JML: No need to reblazon - the "and" is optional, there's a comma there. AmC? : There is a need to reblazon, because of the typo: "andargent" is not valid blazonry. Dragomyr of Morkynwald. Purpure, on a chevron Or another sable, thereon a Maltese cross between two goblets Or. This probably needs to be reblazoned as "...on a chevron sable fimbriated Or...", and recategorized in the OandA? as well. It's currently listed under Or chevrons, when it should be more properly listed under sable. Agrippina di Conti Or, a rose sable, slipped and leaved, barbed and seeded proper, its stem entwined by a serpent, head to sinister, gules. Having checked the emblazon, the rose and snake are definitely coprimaries. I'm not sure how I would change the blazon to specify this, though. ...but the indexing has them as a group of two primaries. Vuongh Manh: Registered 10/1976: Gules, on a hide Or, a flame vert. 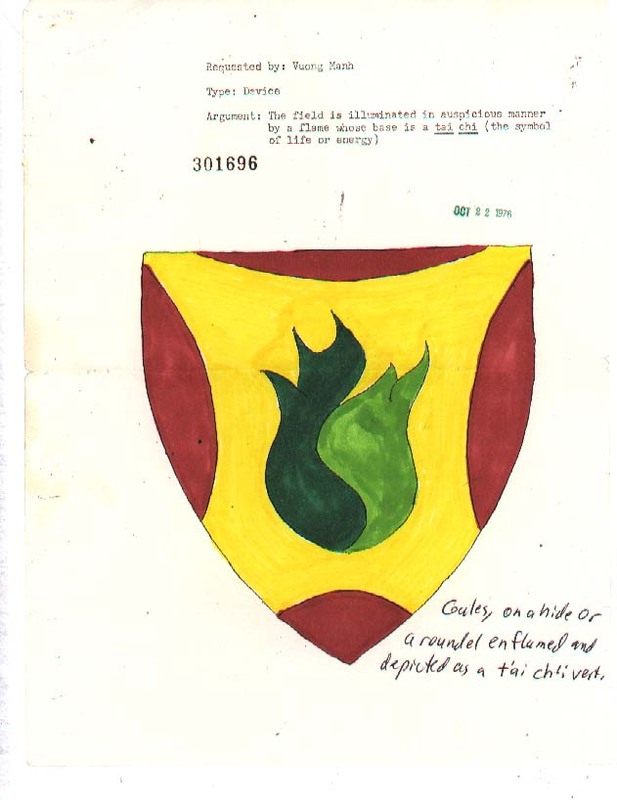 Reblazoned 04/1982: Gules, on a hide Or a roundel enflamed and depicted as a t'ai ch'i vert. Maren of Kilbride Azure, a semé of roses Or, a dragon dormant argent. Not terribly important, but this is the sole case of "a semy" (in any spelling) in the OandA?, and it might be nice to eradicate it. JML: not worth the trouble. Sable, three natural reindeer's heads in pall, necks conjoined, within a bordure Or. A check of the DVD shows that these heads are 'contourny', which should be blazoned. Keira Gunnvorsdottir: Argent, in saltire a drinking horn and a sword inverted per pale sable and gules, all within a bordure gules and sable. The bordure probably needs to be reblazoned as "_per pale_ gules and sable". Morwenna ní Mheachair. Name and device. Argent, a raven displayed sable, on a chief enarched vert a mallet argent. The Letter of Intent dated July 29, 1999, from AEthelmearc blazoned the mallet as "a mallet fesswise argent." The mallet is drawn fesswise head to dexter on the emblazon. The default orientation of a regular hammer (not a Thor's hammer) is head to chief. It would seem that the word "fesswise" was dropped in error. JML: Not an error - long objects default to fesswise on a chief; I'd consider a hammer to fall into this category. Barbara of Arklow. Name and device. Purpure, a pale argent, in fess three leaves palewise counterchanged. Purpure, on a pale between two leaves argent a leaf purpure. The discussion said nothing about the curious blazon that conflates the secondary and tertiary leaves into a single group. AmC? : This type of blazon has been used before: "*Meadowmarsh, Shire of. Or, a pale azure, overall in fess three towers counterchanged within a laurel wreath vert. NOTE: Nice heraldry." (LoAR 02/1984) and "Klement St. Christoph. Badge. Azure, a pale argent, in fess three trefoils slipped counterchanged." (LoAR 11/1985) I find on a quick check. Herveus: The blazon style has not been used in recent memory. Those two citations are over twenty years old, so I place no great stock in them. This one is fresh and ought not be using this confusing blazon style. Istvan: perhaps, to discourage this practice, we should reblazon those items which use this style of blazon? JML: I'm not inclined to reblazon the armory at this time. Per pale counter-ermine and ermine, in pale a wolf's head erased Or, maintaining in its jaws a torch bendwise proper, between two bezants.